Septic systems: What should you do when a flood occurs? Approximately 30% of Florida’s population relies on septic systems, or onsite sewage treatment and disposal systems (OSTDS), to treat and dispose of household wastewater. This includes all water from bathrooms and kitchens, and laundry machines. When properly maintained, septic systems can last 25-30 years, and maintenance costs are relatively low. In a nutshell, the most important things you can do to maintain your system is to make sure nothing but toilet paper is flushed down toilets, reduce the amount of oils and fats that go down your kitchen sink, and have the system pumped every 3-5 years, depending on the size of your tank and number of people in your household. During floods or heavy rains, the soil around the septic tank and in the drain field become saturated, or water-logged, and the effluent from the septic tank can’t properly drain though the soil. Special care needs to be taken with your septic system during and after a flood or heavy rains. 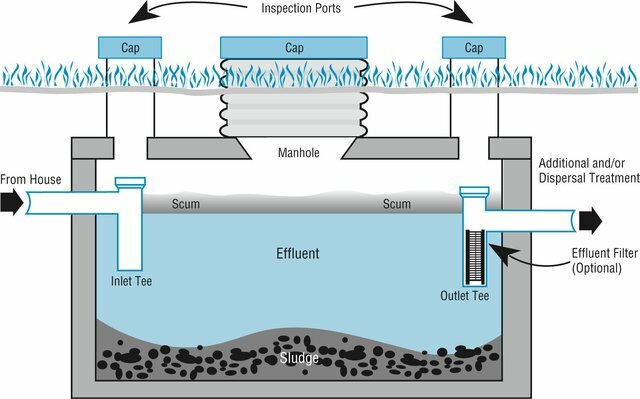 How does a traditional septic system work? The most common type of OSTDS is a conventional septic system, made up of (1) a septic tank (above), which is a watertight container buried in the ground and (2) a drain field, or leach field. The effluent (liquid wastewater) from the tank flows into the drain field, which is usually a series of buried perforated pipes. The septic tank’s job is to separate out solids (which settle on the bottom as sludge), from oils and grease, which float to the top and form a scum layer. Bacteria break down the solids (the organic matter) in the tank. The effluent, which is in the middle layer of the tank, flows out of the tank and into the drain field where it then percolates down through the ground. What should you do after flooding occurs? Relieve pressure on the septic system by using it less or not at all until floodwaters recede and the soil has drained. For your septic system to work properly, water needs to drain freely in the drain field. Under flooded conditions, water can’t drain properly and can back up in your system. Remember that in most homes all water sent down the pipes goes into the septic system. Clean up floodwater in the house without dumping it into the sinks or toilet. Avoid digging around the septic tank and drain field while the soil is water logged. Don’t drive heavy vehicles or equipment over the drain field. By using heavy equipment or working under water-logged conditions, you can compact the soil in your drain field, and water won’t be able to drain properly. Don’t open or pump out the septic tank if the soil is still saturated. Silt and mud can get into the tank if it is opened, and can end up in the drain field, reducing its drainage capability. Pumping under these conditions can also cause a tank to pop out of the ground. If you suspect your system has been damage, have the tank inspected and serviced by a professional. How can you tell if your system is damaged? Signs include: settling, wastewater backs up into household drains, the soil in the drain field remains soggy and never fully drains, and/or a foul odor persists around the tank and drain field. Keep rainwater drainage systems away from the septic drain field. As a preventive measure, make sure that water from roof gutters doesn’t drain into your septic drain field – this adds an additional source of water that the drain field has to manage. By taking special care with your septic system after flooding, you can contribute to the health of your household, community and environment. Dr. Andrea Albertin is the Northwest Regional Specialized Agent in Water Resources.